Safety is a major concern among mines. Automated processes and simulation tools can not only increase efficiency but can improve employee health and safety in the mine environment. Systems that increase automation will limit exposure of workers to hazards such as electrical, noise, toxic products and dust. Remote metering can be a source of significant cost savings for mines due to the large geographical layout, reducing the number of man hours needed to read meters and/or to discover where a problem is located. Additionally, eliminating the need for manual meter reading, means less human exposure to hazards. Mines can better manage their peak demand, balance loads, budget more accurately and find areas for reduced consumption and cost savings by using power management to allocate costs across buildings, departments, or entities within the company. Because they purchase power at a bulk rate and distribute it across departments or processes, there is a need to be able to accurately allocate costs to these various entities within their business. Maintenance cost reductions can be a result of using a power management system to predict problems and prevent failures. Power quality issues are prevalent in the mining industry because minesare typically located at the end of a power grid, which is where most power quality issues are seen. If any power user ahead of them on the grid causes a power issue, the mine receives poor quality power, which can damage any sensitive electronic equipment powered by that energy source. Utilizing metering and metering software, mines are able to capture power quality events in order to show the utility company where the event occurred and work with the utility to recoup any costs associated with bad power (such as equipment damage/loss) and mitigate power quality issues. 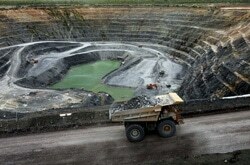 Mines constantly strive to improve their cost per ton. Through energy management systems, mines can understand where and how they are consuming energy, allowing them to reduce excess waste and lower costs. Energy management systems can help mines to decrease their carbon footprint by reducing their energy and fuel consumption.